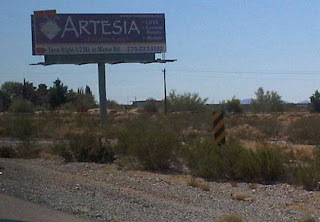 Artesia eh? | Papyrus Watch - Exposing the overuse of the Papyrus font. Looks like this one was snapped while in a car, so kudos to Nate for capturing it. According to Google, this Papyrus billboard could be for any number of things. One thing it isn't is an exit I'll take if I ever come across it.